We didn't eat eggs. So not sure about the fluffiness. But the bed was soft as clouds though. Jokes apart. The place was quiet and awesome. Loved the stay. Will sure have Treebo White MG in mind if we visit Bengaluru the next time for stay. I liked most of it, most of all the courteous staff. Very helpful staff and a property where I felt safe. Very well located close to MG road, so all the best places were around Indirangar, Taj MG , 1 MG road and more... Very very pocket friendly and great service. Highly recommend this place. The beds were nicely made and the room is quite comfortable for the rate and it’s in the prime location. Wonderful location , very close to MG road ,1MG mall and many areas easily accessible. Just near to ulsoor lake , Staffs are wonderful and very helping in nature . Wonderful place who likes very neat and clean. The place is a residential, quiet area away from the busy Bangalore roads. Breakfast is good and the boys and the girl at the reception are very helpful. The daily breakfast (although only dosa, you get to choose which type, how many and what time you’d like it delivered to the room). The location is good - the Ulsoor Lake at one end and MG Road a little further the other way. Extra water when I asked for it. 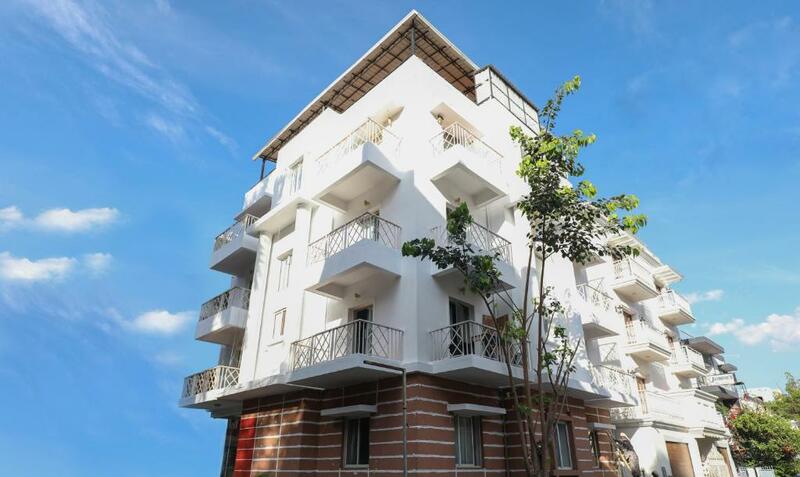 Treebo Trend White MG This rating is a reflection of how the property compares to the industry standard when it comes to price, facilities and services available. It's based on a self-evaluation by the property. Use this rating to help choose your stay! One of our best sellers in Bangalore! Featuring free WiFi throughout the property, Treebo White MG offers accommodations in Bangalore, 0.7 mi from Commercial Street. Guests can enjoy the on-site restaurant. Each room at this hotel is air conditioned and features a flat-screen TV. Some rooms include a seating area where you can relax. You will find a kettle in the room. Every room is fitted with a private bathroom. There is a 24-hour front desk at the property. Guests may use the fitness center or enjoy a meal at the in-house restaurant, Aroma Cafe. Brigade Road is 1.1 mi from Treebo White MG, while Chinna Swamy Stadium is 1.2 mi away. The nearest airport is Kempegowda International Airport, 17 mi from the property. When would you like to stay at Treebo Trend White MG? Please note that this room cannot accommodate extra bed. Hotel surroundings – This neighborhood is a great choice for travelers interested in clothes shopping, shopping and restaurants – Check location Good location – show map Guests loved walking around the neighborhood! House Rules Treebo Trend White MG takes special requests – add in the next step! Treebo Trend White MG accepts these cards and reserves the right to temporarily hold an amount prior to arrival. Poor service lack of manpower in hotel . No kitchen . You ask for anything they will come after 1 hr.. useless to put money for such poor service. The balcony in the room is the only + point. The location stated as Aga Abbas Ali Road is a small lane which is down Ggandar Chetty Rd which is the main road, Since there was no mention of Ghandar Chetty Rd our airport taxi driver could not locate the hotel. This happened twice during our stay where the taxi / auto drivers could not locate. Hotel phone also is not picked up promptly to get the directions. The Manager of the hotel was not very friendly. Cleanliness of the bathroom and room could be improved. The staff espicially the manager with a stone face, no welcome no smile. Looking at him makes us feel that we are not welcome.. Anything we ask him he talks money and only money. My credit card showed that the room rent is debited to Dr. Shashidhar Kumar and not to Treebo, WHY? It's not a dislike. But would have better if there was a restaurant in the hotel. And the female receptionist's behaviour towards an elderly customer was bit concerning. Kind, polite and Sweet is what describes a receptionist which we were unable to see.